Having a business website is essential in the modern world. The most effective real estate websites should be driving high-quality leads and clients to agents. Ultimately, this is the main job of any online business presence: to get new business. However, many real estate agents have websites that are not living up to their lead generation potential. The problem is that most agents set their websites up, put the hosting on auto-pay, and then never think about them again. The good news is that its fairly easy to breathe new life into any real estate website. And a few small tweaks can help get lead generation back on track. Check out some tips for getting the most of real estate websites. Stone Temple’s Mobile Versus Desktop Study revealed that as of 2017, 63% of all web traffic was on mobile devices, while desktop computers only made up 37% of traffic. This mobile trend is on a continued upward projection. Yet, most real estate agents have their websites optimized for desktop viewers. For real estate, NAR reported that 95% of homebuyers used websites during their home buying process. Of those online searches, 72% were made on mobile-friendly websites or apps. The moral of this story? The most effective real estate websites should be designed as mobile-friendly in order to get the most lead interaction. Additionally, sites that are mobile-friendly are ranking higher on Google. Google recently changed their algorithm so that mobile-friendly websites are ranked higher than those that are only optimized for desktop. Ensuring a site is mobile-friendly is pretty straightforward. Simply search “mobile friendly” on Google and a little search bar will appear that will check if any website is mobile-friendly. Simply paste the URL into the search bar and hit run. If the site is not optimized for mobile devices, it may be a quick fix. If using WordPress, simply log in and check on the theme. Usually, there will be a button or tab to turn on mobile-friendly features. If the site needs a total refresh, and the theme does not include any mobile-friendly features, real estate website companies like Blue Fire Sites offer great real estate specific solutions. Many agents use IDX/MLS feeds to showcase listings on their websites. However, not every agent is using IDX to capture detailed lead information. IDX feeds are great because they offer home buyers a chance to search for homes by neighborhood or by specific search criteria that generic search providers like Zillow don’t always provide. 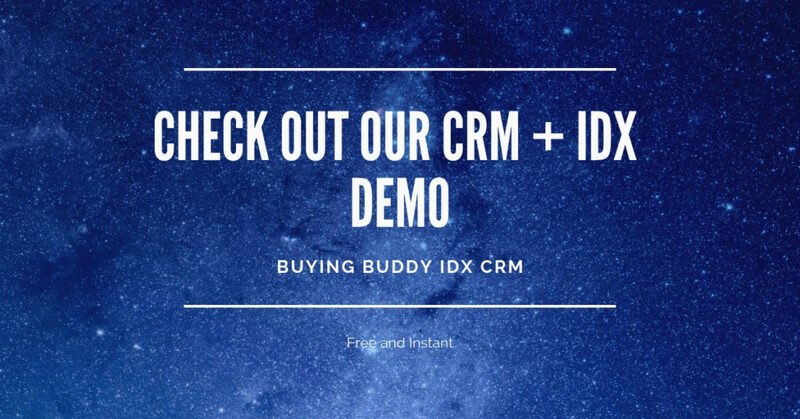 Services like Buying Buddy CRM + IDX, allow agents to collect detailed home search histories for each website visitor. If a lead is visiting the website, the agent can see which neighborhoods the lead is looking at, what style of property, how many bedrooms, baths, the zip code, etc. Then, by creating a pop-up offering to send free relevant listings to lead via email or text, the website collects the leads’ contact information when they enroll. The lead is captured and the agent immediately sees the contact information for the lead and their entire home search history. It is very easy to then snag the lead. In the NAR report mentioned earlier, 44% of home buyers used the internet as the first step in the home buying process, before they reached out to an agent. That means it is a prime time to convert them. The most effective real estate websites not only promote traffic, but also generate business. If a real estate agent’s site is optimized for only the words “Chicago real estate,” chances are the Google ranking competition will be pretty stiff and the lead conversion rate will be very low. However, if an agent creates many targeted long-tail keyword pages like, “Highland Park, Il townhouse for sale” it is likely that the SEO competition will be much lower and the lead conversion rate will be much higher. There are a number of ways to find long-tail keywords, including some that are free. The most effective real estate website use long-tail keywords to drive better lead traffic. By creating landing pages with targeted long-tail keywords for their area, agents can jump ahead in the rankings while pulling in hotter leads. Real estate blogs can fulfill a variety of purposes for real estate businesses. They can let clients and local communities get to know an agent. They also can build trust and set an agent up as an expert in their area’s real estate market. Most importantly, they can send leads and clients to the agent’s business. Content marketing through blogging is one of the best ways to actively get leads. Many agents do not blog regularly because they are not sure what to write about or they don’t have the time. The good news is that in 2019, those issues are easily fixed. Short on time? Try outsourcing. There are a number of simple, cost-effective ways to outsource. These options include utilizing an already existing assistant, using cheap or free writing/media students from any local college or university, or by using an online content service like Textbroker.com or Upwork.com. Each post should be a mini-landing page that has your contact information and links to drive people to the rest of your website. The most effective real estate websites keep position agents as local authorities, get leads to continue revisiting the site, and connect with leads through content marketing. Its no secret that leads are hanging out on Facebook, Instagram, Pinterest, or other social media sites. These platforms can be very powerful and the most effective real estate websites funnel traffic with them. Linking blog posts on Facebook, Instagram, Pinterest, etc. are free ways to stimulate website traffic. And free accounts from automated services like Buffer make it easy to share content across all social media accounts from one place. Additionally, by including links to social media accounts on blog posts, website visitors can connect to real estate agents and their past clients through other social channels. The most effective real estate websites should generate leads for real estate agents. By going mobile, capturing leads with IDX, using long-tail keywords, utilizing content marketing, and connecting through social media agents can drive up traffic on their sites and engage with new leads.